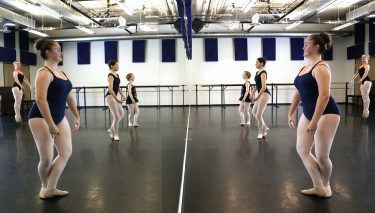 Dancers learn a variety of styles during GCU Summer Dance Intensive. The dancers line up in rows of three, heads slightly cocked, their legs bent as though preparing to spring. As the music starts they uncoil, sweeping their arms over their heads and leaping in unison. “Assemblé! Assemblé! Assemblé!” teacher Kevin Godfrey-Chevalier calls out in French (pronounced ahs-ahm-BLAY), appropriate for ballet. The dancers energetically kick their pointed toes, then gracefully brush the floor with their feet before pirouetting, seemingly weightlessly, like willow trees in a gentle breeze. Practice makes perfect in the Summer Dance Intensive. 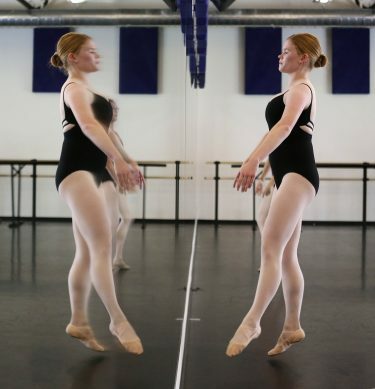 During a break, Savannah Leverich, one of 22 dancers in GCU’s third Summer Dance Intensive, says she is thrilled she made the trek from Modesto, Calif., to be in the program. The packed schedule for the two-week session includes world dance, ballet, jazz and contemporary dance as well as classes on composition and conditioning, health and wellness. The camp features a final performance at 4 p.m. Friday, July 22 in Ethington Theatre. “We’ve got some extremely talented dancers in this group who are very driven,” says Susannah Keita, director of dance in GCU’s College of Fine Arts and Production. Dancers practice jazz, ballet, world and contemporary styles in the Summer Dance Intensive. Attendees hail from Arizona, California and Idaho, Godfrey-Chevalier says, to practice jazz, ballet, world and contemporary styles. 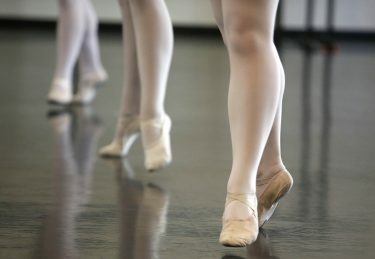 In three years, the number of dancers has more than doubled. Taught by dance faculty and guests and assisted by dance department student-teacher candidates, the high-level curriculum also acts as a recruitment catalyst, Keita says. Haley Keil, who attends College of the Desert in Palm Desert, Calif., hopes to become one of those students. “I enrolled in the Intensive because I wanted to scope it out,” she says. The camp features an end-of-session performance at 4 p.m. Friday, July 22 in Ethington Theatre. What she learned exceeded her imagination. Maricela Baeza is a Washington High School student who also is considering applying to GCU. “I want to go into business with dancing on the side,” she says. Soon the dance students are stretching out for jazz class. Godfrey-Chevalier demonstrates the steps of the jazz dance in sequences of eight beats. For one move, the dancers are asked to roll their backs into a reverse arch. Another involves landing properly on one foot. “You truly fall onto that leg,” he says. So they regroup, preparing to assemblé, pirouette and do other steps once more.